After WWII, the Korean peninsula was briefly united again as The People’s Republic of Korea. However, the unification wouldn’t last. 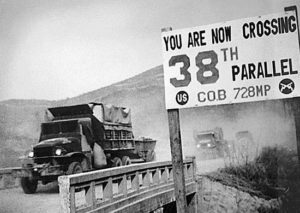 American and Soviet forces divided the peninsula along the 38th parallel, and in the north the Soviet Union set about creating a puppet state. However, the leader they chose, Kim Il Sung, and the founding ideology of their new state would not play out entirely as they had planned.